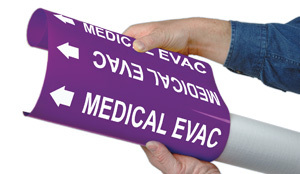 EZ Medical Gas Pipe Markers comply with the NFPA 99 2018 Health Care Facilities Code and CGA C-9 2013 Standard Color Marking of Compressed Gas Containers for Medical Use. 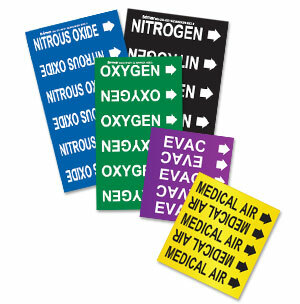 EZ Medical Gas Markers are made from durable outdoor grade vinyl and aggressive acrylic adhesive for pipes ranging from 3/4" through 7-7/8" in diameter. 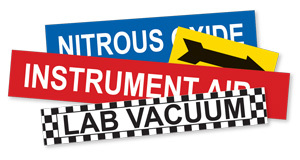 Clean and dry surfaces are required for installation. 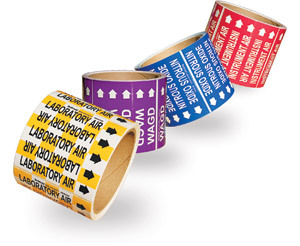 EZ medical gas pipe markers comply with ANSI & ASME A13.1 2015 standards if used in conjunction with arrows sold separately.